There can be no denying Dhanush is one of the most successful and charismatic stars in Tamil cinema today. During his successful career, he has won the love of movie buffs thanks to his gripping performances, charming personality and effective screen presence. 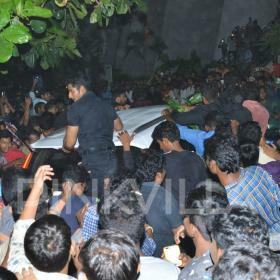 Moreover, he has impressed fans because of his humble nature and bindass attitude. Now, his well-wishers have a reason to rejoice once again. As it so happens, some photos from the sets of ‘Enai Noki Paayum Thota’ are creating a buzz amongst movie buffs and that too for all the right reasons. 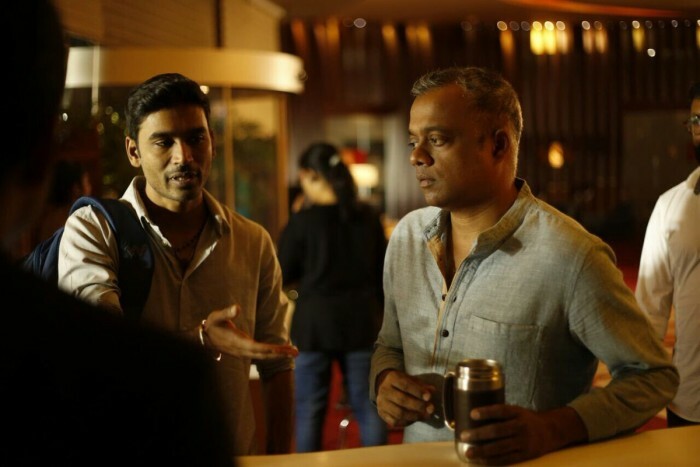 In them, D can be seen sporting a new look as he discusses something with director Gautham Menon. We are sure that this neat look is going to create a buzz amongst fans and add to the curiosity surrounding the film. In case you did not know, ‘Enai Noki Paayum Thota’ is one of GVM’s most ambitious projects and was launched in March 2016. A few months after being launched, the film was put on hold as GVM turned his attention towards ‘Dhruva Natchathiram’. Interestingly, its teaser was launched in December 2016 and it created a buzz amongst movie buffs courtesy its gripping presentation. This October, GVM revealed that the film’s music will be composed by Kidari fame Darbuka Siva. Interestingly, GVM had kept the name of the composer a top secret till that point. On a related note, this is a busy time for GVM as well as Dhanush. GVM’s next big release is ‘Dhriuva Natchathiram’. The film is a spy-thriller and features superstar Vikram in the lead. The female leads are Aishwarya Rajesh and Ritu Varma. Sometime ago, Aishwarya had praised the filmmaker and thanked him for giving her a challenging role. “Gautham sir’s dialogues require some getting used to. His style of dialogue delivery was a bit complicated to adapt to. At times, one forgets that the shoot is actually taking place because it feels like a test shoot or an audition. I’ll be joining the team again in June for about 20 days. The role offers me a lot of scope to perform, and I feel lucky to act under Gautham sir,” she had told a leading daily. As far as Dhanush is concerned, he currently has ‘Maari 2’ and the Hollywood film ‘The Extraordinary Journey of The Fakir’ in his kitty. 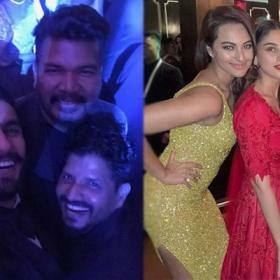 ‘Maari 2’ is touted to be gangster drama and is a sequel to ‘Maari’. In it, he will be seen alongside Southern cinema’s newest heatthrob Sai Pallavi. The young lady has become immensely popular because of ‘Fidaa’ and ‘Maari 2’ could help her take her career to news heights. As far as his Hollywood film is concerned, it has created a buzz courtesy its posters and could turn out to be a big release for him. Sometime ago, he had said that the film was a learning experience for him. “Irrespective of the industry I work in, I’m constantly learning from the people I work with. If Bollywood taught me a lot about production, Hollywood has been a revelation in terms of understanding filmmaking better,” he had added. He has also added that ‘The Extraordinary Journey of the Fakir’ is a very positive film. “It’s God’s grace that I landed this offer. Although I have been offered three Hollywood projects, the script of this one really convinced me to sign it. It’s a very strong role. I play a character called Ajatashatru, a street magician,” he had added. As it so happens, Dhanush is producing ‘Kaala’ under his production banner. The film features hids FIL/legendary actor Rajinikanth in the role of a gangster and will release in 2018. Sometime ago, it was rumoured that he would be doing a cameo in ‘Kaala’. And, this had created quite a buzz amongst fans. Responding to this rumour, he had said that he is yet to take a call on the matter. We wish D good luck and hope his upcoming films do well at the box office.